We all want a beautiful smile that is one of our best features, right? But, did you know that having straight teeth can also be an advantage to your oral health? Naturally, teeth that are aligned properly make it possible to do a better job when brushing and flossing. When a toothbrush and floss can reach those tight angles where oral bacteria to tend accumulate, you are less susceptible to cavities and periodontal (gum) disease. However, another advantage of teeth that are properly aligned may surprise you. Teeth that are positioned correctly work together harmoniously when chewing, speaking and even yawning. When the bite is misaligned, this clash can radiate to the TMJ (temporo-mandibular joints), or jaw joints, causing stress and strain. The jaw joints lie just in front of the ears and hinge the lower jaw (mandible) to the skull. Issues that relate to TMJ problems (known as ‘TMJ disorder’) can include frequent headaches, migraines, sore jaw joints, ear ringing, facial pain, jaw popping, difficulty opening the mouth fully, and sore shoulder and neck muscles. Some people are unaware of having TMJ disorder since many of its symptoms are seemingly unrelated to the bite or jaw joints. Some spend years going from specialist to specialist, having test after test run, only to find minimal, if any, relief. This is why is it so important to be committed to your 6-month dental exams. Among other things, this is an opportunity for your dentist to check your bite alignment and look for signs of night-time grinding. During sleep, misaligned teeth can prompt the jaws to seek out a comfortable fit. In a number of cases, this leads to night-time clenching and grinding, known as bruxing. Bruxing can result in worn teeth as well as broken, chipped or fractured teeth. And, the importance of the unified movement of these joints goes even further. Some sleep apnea has also been linked to ‘malocclusion’ (misaligned bite). (See article “TMJ & Its Link To Headaches, Sleep Apnea”: dental.sleepreviewmag.com/2015/07/tmj-and-its-link-to-headaches-sleep-apnea/). As a dentist who has completed advanced training in the diagnosis and treatment of TMJ disorder, I’ve restored many patients to full comfort through adjustments to their bite. Some adjustments require only minor reshaping of certain teeth or the placement of crowns to bring the bite back to a harmonious position. However, some bite disparities are such that realignment is needed. This is one reason I completed the training to become Certified in Invisalign. This comfortable, virtually ‘invisible’ alternative to braces helps adults avoid the awkward look and uncomfortable feel of brackets and wires used in traditional braces. 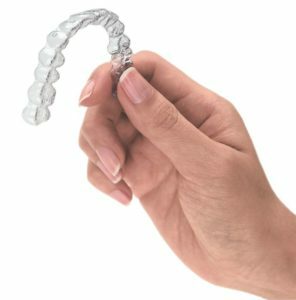 Invisalign moves teeth with clear, custom-contoured molds that are designed to snap snugly over teeth. These can be removed for eating and brushing. Invisalign gently guides teeth into proper alignment in a time frame similar to or, in some cases, even faster than traditional braces. At Riverside Dental Arts, we want your smile to be healthy, beautiful and supportive to your overall health. With proper bite alignment, you can also avoid many uncomfortable, even painful, problems that can stem from TMJ disorder. Let’s discuss your symptoms or smile goals. Begin with a free consultation to determine if Invisalign may be right for you. Call 910-254-4555. While you’re here, we can also have our Financial Coordinator discuss easy, monthly payment plans, if desired. Most are interest-free with no down payment required. This entry was posted in Beautiful Smiles, cavities, Cavity repair, clenching & grinding teeth, Cosmetic Dentistry, crooked teeth, crowded, Crowns, Dental Care in Wilmington, Dental Hygiene Cleanings & Check-Ups, Financial Plans, Gentle Dentist, headaches, Invisalign, migraines, New patients, Oral Health & Wellness, Payment Plans, Smile Makeovers, Sore, TMJ & Bite Realignment, Wilmington Dentist. Bookmark the permalink.